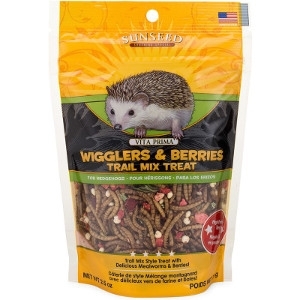 Delicious trail mix-style treat designed specifically for hedgehogs with some of their favorite ingredients, including mealworms, celery, and strawberries. Vita Prima Trail Mix Treat is the tasty reward hedgehogs love and fun snack they deserve! The blend of ingredients helps to satisfy foraging instincts and bring some high-protein variety to their diet.